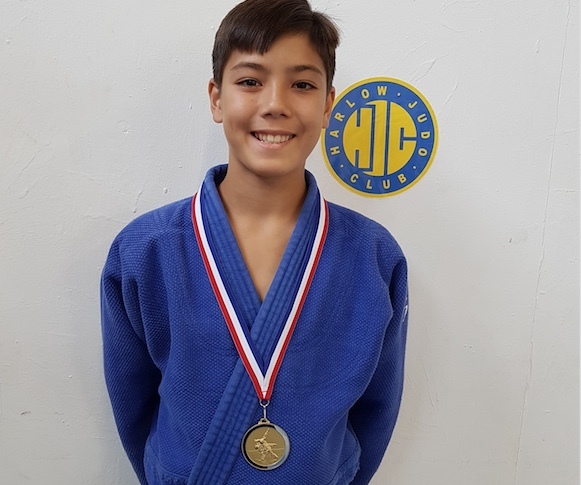 THE Midland Area Heart of England Open Judo Championships in Walsall, was the destination for Owen Lambert (12) of Harlow Judo Club. This level 3 event is split into Pre-Cadets, Cadets, Juniors and Senior categories and attracted good quality judokas from all the country. Competing in his final year as a Pre-Cadet, where players are born in the years 2005-2006, before moving up to Cadets next September, youngster Owen (12) dominated all his fights in his new weight category to make it through to the final where he threw his opponent in under 9 seconds winning by Ippon (maximum score). He displayed not only good tachi-waza (standing techniques) throughout his fights, but also where necessary, pinning his opponents down in ne-waza (ground work). Head coach Mick Ellis said that today, his young player displayed a wide variety of judo techniques throughout his contests and was good to watch – even from the coaching side.